Went in without a clue and had a lot of fun! I never played the game and had no idea what I was getting into. That said, I loved it! Except for the annoying fan service, being part of actual mystery solving is really fun! The MC is really fun, most of the characters are fun and the crimes are challenging and fun to solve. A great show for kids if they can handle the slight gore and violence and the occasional fan service. I think if I had watched this as a kid, I would've wanted to be a lawyer too! P.S. Go ahead and watch the dubbed version, it's great! I actually played the game so I know what I am looking at in this one. This is the best show and game you will ever see and play known to me. The game is all about what Phoenix Wright would do in cases like these. The show and the game are both magnificent. The game is called "Phoenix Wright Ace Attorney".. This anime was what exposed me to what Ace Attorney was. 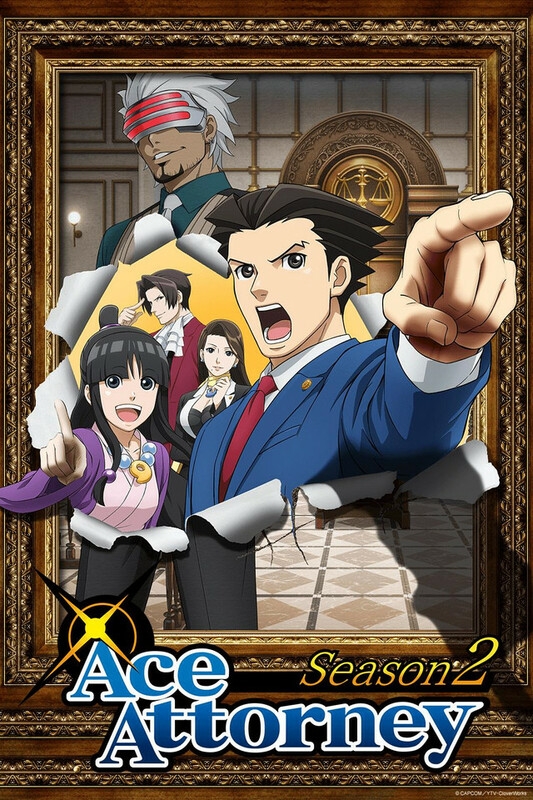 However, after watching YouTube videos on the games, which I should have done earlier, the story line for some cases are not in the correct order as intended in the game, such as Justice For All or Trials and Tribulations, where the first episode in season two was the first case of JFA and the upcoming episode 13 of season 2 would have been the first case. Knowing the original trilogy, not based of the new releases of them, it is almost two decades old, as in 2019. Despite that, the comedic and dramatic scenes go quite well, but some cases don't follow the original script, due to possible reasons. Please do keep in mind that this anime wasn't for perfection, but to expose newcomers to the Ace Attorney games. That in mind, enjoy watching. It feels like forever ago that a friend recommended the games to me and I fell in love with the goofball characters and the perfect mix of off-the-wall comedy with heart-breaking drama. The anime perfectly retells the story from the games while not adding or cutting too much from the source material. Normally I nitpick adaptations over the things they change, but I can't find much to really criticize even as a massive Ace Attorney fangirl. This anime is a sped up version of the games. if you havent played the games this anime will do absolutely nothing for you. it will seem too fast and you'll be left in the dark. its not an anime that lets you play along with the mystery because that is what the games are for. I'd say only watch an episode or two to get a feel for the series if youre interested then do the games so you dont get spoilers to the tricks. If you have played the games, you would think this anime is pretty useless. It's pretty much an animated version of the first game. The point of this anime I feel is to introduce people to the game, characters, and plot lines of a game series that has been around for a while. I enjoyed it for what it was. If you are a person who has wanted to know what the games were about, but didn't want to spend money on all of them, then you can watch this show and see if you are interested. This was honestly a great retelling of the games! It takes the core elements and lore of the games while making it a bit different than the original material. Of course, it removes the slower aspects of the source material, as it is meant to be a suspenseful anime. The anime provides a nice nostalgic feel for those who have played the games before, as they would remember the cases and evidence from their run through the games. The anime can also be viewed by people who have never played the game before. It provides all of the lore necessary to understand the anime even for those who have never experianced the games. Overall, it's a great anime for fans and newcomers to the franchise! It's got some warts but not bad overall. Never played the game so this review will be only about the anime. Watched the first 13 episodes on funimation and i liked it especially the kooky names in the dub (its a pretty good dub) the cases were pretty much all the same as were the court room antics which isn't saying that they were bad just not different but it was still interesting to watch the cases play out and actually were a little similar to the old Perry Mason series in the 50's and 60's. Their were some memorable characters the animation was pretty good and had very little fan service overall it was fun to watch and I didn't laugh much but I did chuckle a bunch it did get silly at times. I'm giving a solid 4 here and a 7.5 on a 1 to 10 scale you could watch this with older kids and I'd recommend it. Enjoyable, but perhaps a little too close to home. This was a very solid and well made series. It's very faithful to the original source material, and it still had all the beats that I believe any fans of the first two installments of the Ace Attorney video game series would hope to find here. However, sometimes I would grow bored with how too close to the original material they got. I found myself most excited when the show was doing things, or showing us concepts that were not in the original games. There's an episode near the end of the first cour that goes in depth with the histories of some of the characters during their childhoods. In one episode near the end, there's a very funny little original plotline where they try to bide time during a trial, and they have one character filling in for another. Also the ending of the circus case had a lot of new fun elements that made it a very fun and memorable episode. These moments I believe were the highlight of the series, but unfortunately, they were so few and far between that it made the rest of the series kind of dull. It's a tricky series to recommend. If you're a die hard fan of the games, like myself, I think you may find yourself in the same position as myself, where there's very little to offer here if you're already very familiar with the stories. If you've never played the games before, I would recommend playing those instead of watching this. The pacing, detail, and overall execution and style I believe far trumps, and offers a much more effective experience than this series does. However, maybe if you're in the position where you've played the games a long time ago, and have forgotten much of the story, and are in the mood for a refresher on what all happens in this crazy series, maybe then I would say this is perfect for you. So, while it's not bad, the fickle position of this adaption being overly faithful makes it tough for me to universally recommend, and therefore, I cannot confidentially give it anything higher than three stars. Ace Attorney is based off the Capcom series of the same name. I will be honest, when I heard that they were making it into an anime I was extremely happy! The characters are very well written, making them be relatable, lovable, and in some cases, hateable. The story is very good. I need a season two covering Trials And Tribulations, and maybe even Apollo Justice!